A healthy diet can contribute to mental health, and theres good reason to include soy in its various forms in everyday meals. These days most supermarkets carry a number of soy products including tofu, meatless burgers and sausages using soy substitute, cooked soybeans, edamame beans, miso, soy milk, and soy nutrition bars. Erika Dillman provides helpful information about what soy is, its healthy properties, and how to prepare and cook it. Probably the most useful part of The Little Soy Book is its 59 pages of recipes, including Double Chocolate Soy Brownies, Brunch Quiche (with soy ham and tofu), Tusc-Asian Bean Soup with Garlic and Sage, Vegetarian Chili over Mashed Potatoes, and Curried Red Lentil Stew with Tempeh. The sections explaining different soy products, including soy milk, soy sauce, tofu, tempeh, miso, soy nuts, soy nut butter, soy ice cream, soy yogurt, soy cheese, and soy flour. It would have been helpful to have more information about different brand names and maybe a franker discussion of the taste and texture of the different products. For example, not everyone is going to agree that soy milk tastes as good as cows milk, and it would be useful to know which brands are most like cows milk. Of course the book is little, so there are no photographs and the explanations of ideas are brief. 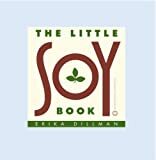 Id imagine that most readers planning to start cooking with soy would want more information and pictures, and so they might look for vegan cookbooks, but The Little Soy Book may be useful as an introduction to soy.